Drug development is a complex process that is associated with high drug-candidate attrition rates, long development times, and high costs (1, 2). Drug development costs have increased over the past two decades, with current average development cost of about US$2.6 billion, of which $1.4 billion is the direct cost (1, 2). On average, drug development takes at least 10 years to market authorization (2). Biopharmaceutical companies often follow a strategy of developing drugs for multiple clinical indications and biological targets simultaneously to increase probability of their drugs’ regulatory approval. Because multiple drugs can be commercialized for the same indication by different biopharmaceutical companies, time of exclusive market share is decreasing (3), and late-entrant drugs are sometimes unable to differentiate from existing commercial drugs. Contrarily, late-entrant drugs can take significant market share from established competitor drugs. A drug becomes more successful than others because of its competitive advantage. SMC Consulting Group previously focused on operational efficiency based on revenue per FTE and cost per FTE (4), relocation to low-cost countries (5), and use of a virtual-company model (6). But other areas of competitive advantage also can guide drug development to capture greater market share. Market strategy and competitive advantage have been studied extensively using models such as Porter’s Five Forces, BCG Matrix, McKinsey’s 7S, and 4P’s of marketing (7). These models consider competitive advantage from the perspectives of business, industry, operational/organizational structure, and customer relationships. However, SMC believes that none of the models can explain in detail the scenarios in which a drug can take significant market share from other drugs for the same indication. 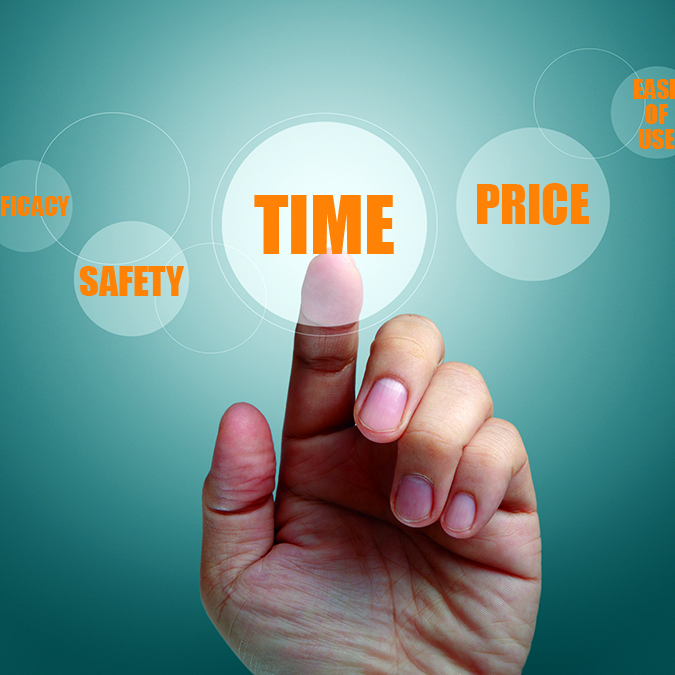 As a result, SMC developed a model of competitive advantage (superior–time–ease–price or STEP model) that is based on the four dimensions of superior safety and efficacy, time, ease of patient use, and price (Figure 1). Time dimension (first-in-class or first-to-market) is the most common strategy pursued by the biopharmaceutical companies, but examples exist in which biopharmaceutical companies have implemented other strategies. For example, Lipitor atorvastatin calcium (from Pfizer) was the fifth statin and so did not have the advantage of time. But it had the advantages provided by other dimensions, and it became the best-selling drug to date (8). The four dimensions are superior safety/efficacy, time, ease of patient use, and price. Each factor is important on its own, and each can lead to another. Superior Safety and Efficacy refers to a drug that is best in class in its area. That means it has superior safety and efficacy profiles over competitor drug products. For example, in a phase 3 clinical study for advanced melanoma that compared two cancer immunotherapies pembrolizumab and ipilimumab, the former was associated with higher response rate and longer progression-free survival rate (9). A drug’s superior efficacy and safety profiles can increase the number of times it is prescribed by physicians and adopted by patients. Time is the industry’s most commonly pursued dimension. Success here comes with being first in class or first to market. Bringing a drug first to market facilitates its adoption by patients without competition, drug pricing without competitive pricing considerations, and establishment of leadership position for an indication (10, 11). With market exclusivity, a company can enjoy maximal profits, and it has flexibility to reduce drug price in case of later competition. But the time dimension can come with developmental challenges such as a lack of prior safety/efficacy data for a new class of drugs, additional regulatory requirements to demonstrate safety and efficacy, and the need to create a new market. Multiple examples illustrate this time dimension, including Lucentis ranibizumab (from Genentech) for wet age-related macular degeneration and Mevacor lovastatin (from Merck) for lowering cholesterol. Ease of patient use comprises all factors that can increase perceived and actual convenience to patients. Use of oral instead of injectable drugs reduces the need for physician administration and addresses patients’ needle phobia. Gilenya fingolimod (from Novartis) and Tecfidera dimethyl fumarate (from Biogen) — oral drugs for multiple sclerosis — incorporated this dimension compared with Tysabri natalizumab (from Biogen), an injectable multiple sclerosis drug (12). Self-administration by means of medical devices and fewer doses during a treatment period reduce physician visits and offer patient convenience. For example, insulin pens offer greater convenience to patients than insulin vials (13). Longer-lasting depot formulations reduce number of doses and physician visits, especially for drugs with short half-lives such as in case of Sandostatin versus Sandostatin LAR octreotide acetate (from Novartis) (14). Fewer doses and fewer physician visits also can reduce total treatment cost, thus incorporating the price dimension. Price dimension refers to a drug being priced lower than competitor drugs with similar safety and efficacy profiles. With significant increases in healthcare costs, companies face pressures on drug prices from the payers such as patients, insurance companies, and government agencies. Small differences in drug price compounded by large patient volume can lead to substantial benefits for payers. Some payers are able to negotiate exclusivity to one drug in exchange for lower drug prices (15). Aspects of the ease of patient use dimension can contribute to the price dimension: e.g., fewer doses during a treatment period, self administration instead of physician administration, and complexity of drug administration. Bruce Henderson developed “rule of three and four” hypothesis, which states that a stable competitive market never has more than three significant competitors, the largest of which has no more than four times the market share of the smallest (16). Assuming that this rule applies to multiple drugs for the same indication, it will be desirable to incorporate all four (or the majority of) dimensions of competitive advantage during drug development — even if a drug has a time advantage (first in class). This strategy will mitigate risk of losing market share and provide lifecycle competitive advantage. Although the time dimension offers an opportunity to establish leadership position, late entrants can learn from experiences of first-in-class drugs and address limitations. 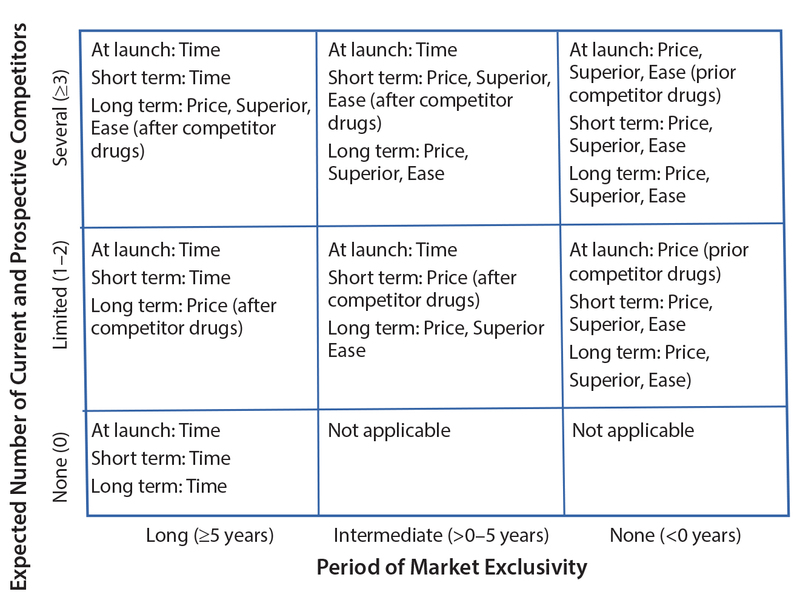 Late-entrant drugs can incorporate the other three dimensions to achieve competitive advantage over established, first-in-class drugs. 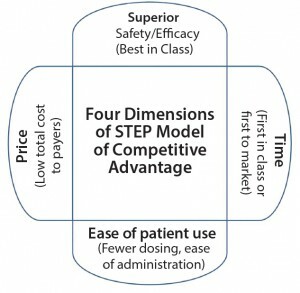 Figure 2: Generic competitive advantage matrix with recommended minimum dimensions to be pursued; “Superior” refers to superior safety/efficacy, and “Ease” refers to ease of patient use. Values for number of competitors and period of market exclusivity in the axes are included as examples. Because of high development costs and long development times of some drug products, biopharmaceutical companies may need to strategically prioritize and incorporate the most relevant competitive-advantage dimensions. In pursuit of this strategic prioritization, SMC developed a matrix (Figure 2) that can help biomanufacturers identify and focus on appropriate competitive-advantage dimensions. The axes of that matrix are expected number of competitors and period of market exclusivity because the need for and type of dimensions both depend on competitive landscape. Several key points should be noted in this generic matrix. First, the time dimension is sufficient when no current and prospective competitor drugs are expected. Second, when limited competitor drugs are available, the price dimension allows immediate competitive advantage because of an ease of implementation and potentially immediate impact. However, other companies with competitor drugs can use the same dimension. So both the superior safety–efficacy and ease-of-patient-use dimensions must be pursued as follow-on to the price dimension to maintain competitive advantage in the long term. Third, when several competitor drugs are available, the price dimension will not be sufficient because of the risk of a price war. Superior safety and efficacy and ease of patient use must be pursued simultaneously with the price dimension in case of several competitor drugs to differentiate from the competitor drugs. Finally, for first-in-class drugs, some or all of the superior safety–efficacy, ease of patient use, and price dimensions should be implemented after competitor drugs are available. 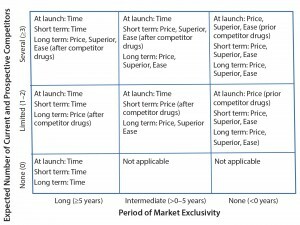 For late-entrant drugs (period of market exclusivity <0 years), some or all of those dimensions must be introduced at launch. Starting 10-mg dose of Lipitor atorvastatin helped the majority of patients reach their target LDL levels, thereby reducing the need for repeated dose adjustments (ease of patient use dimension). By leveraging dimensions of competitive advantage, this significantly late entrant not only achieved competitive advantage, but it also become the best-selling drug. Similarly, biopharmaceutical companies must perform a holistic evaluation of all four STEP dimensions to strategically develop and position their drugs to achieve competitive advantage for commercial success and patient benefit. 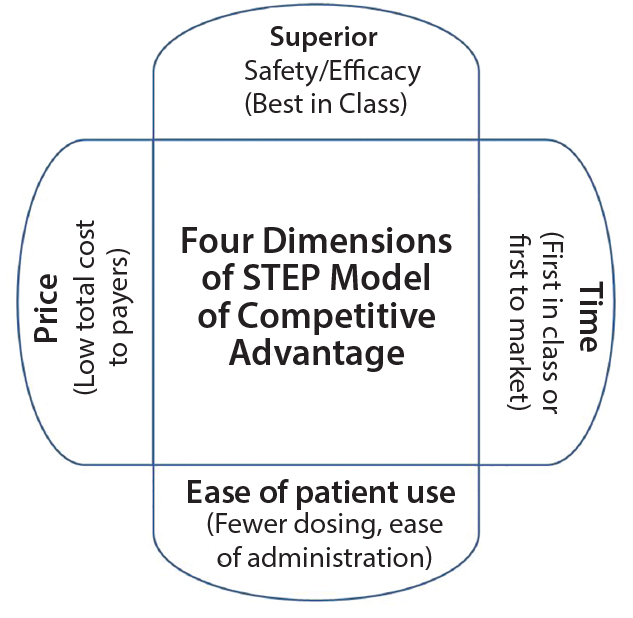 SMC has developed a model of competitive advantage (STEP) based on four dimensions: superior safety and efficacy (best-in-class), time (first-in-class), ease of patient use (patient convenience), and price (lowest price). This model can be used to analyze different scenarios in which a drug can take significant market share from other drugs for the same indication. Although the time dimension is the most commonly pursued factor in the biopharmaceutical industry, late entrants can be strategically developed and positioned by leveraging other dimensions to achieve competitive advantage. In general, it is recommended that biopharmaceutical companies incorporate all or a majority of those dimensions during drug development to achieve and maintain significant market share. As the biopharmaceutical industry evolves with technological, regulatory, and economic changes, the applicability of additional dimensions of competitive advantage besides those discussed herein should be considered. 1 DiMasi J. Innovation in the Pharmaceutical Industry: New Estimates of R&D Costs. Tufts University: Medford, MA, 18 November 2014; http://csdd.tufts.edu/files/uploads/Tufts_CSDD_briefing_on_RD_cost_ study_-_Nov_18,_2014.pdf. 2 2015 Profile: Biopharmaceutical Research Industry. Pharmaceutical Researchers and Manufacturers Association; www.phrma.org/sites/default/files/pdf/2015_phrma_profile.pdf. 3 DiMasi JA, Paquette C. The Economics of Follow-On Drug Research and Development: Trends in Entry Rates and the Timing of Development. Pharmacoeconomics 22(supplement) 2004: 1–14. 4 Jain S. Revenue per FTE and Cost per FTE: Metrics of Operational Efficiency and Performance. BioProcess Int. 12(11) 2014: 22–25. 5 Jain S. A Case for Biopharmaceutical Operations in Low-Cost Countries to Maximize Return on Investment. BioProcess Int. 13(2) 2015: 16–20. 6 Jain S. When Is a Virtual Business Model Suitable for Biopharmaceutical Companies? BioProcess Int. 13(4) 2015: 16–17. 7 The Bloom Group, LLC. Business Frameworks: Working Document. October 2009; http://bloomgroup.com/sites/all/files/Theory%20of%20Business%20Frameworks.pdf. 8 Afuah AN. Lipitor: At the Heart of Warner-Lambert. University of Michigan: Ann Arbor, MI, December 1999; www-personal.umich.edu/~afuah/cases/case26.pdf. 9 Robert C, et al. Pembrolizumab versus Ipilimumab in Advanced Melanoma. New Eng. J. Med. 372, 2015: 2521–2532. 10 Schulze U, Ringel M. What Matters Most in Commercial Success: First-in-Class or Best-in-Class? Nat. Rev. Drug Disc. 12, 2013: 419–420. 11 Andrade LF. Entry Time Effects and Follow-on Drugs Competition. Institut de Recherche et Documentation en Économie de la Santé: Paris, France, 2011; www.ces-asso.org/sites/default/files/Entry_times.pdf. 12 Maas A. FDA Approves Long-Awaited Oral MS Drug: Tecfidera May Have Huge Impact on Class. Atlantic Information Services, Inc.: Washington, DC, 29 April 2013; https://aishealth.com/archive/nspn0413-01. 13 Page MR. Insulin Pens: Improving Adherence and Reducing Costs. Pharmacy Times 19 May 2015; www.pharmacytimes.com/publications/directions-in-pharmacy/2015/may2015/insulin-pens-improving-adherenceand-reducing-costs. 14 Garland J, et al. Sandostatin LAR (Long-Acting Octreotide acetate) for Malignant Carcinoid Syndrome: A Three-Year Experience. Alimentary Pharmacol. Thera. 17(3) 2003: 437–444. 15 Staton T. Thanks to Hep C Pricing War, Gilead, AbbVie Both Score Spots on Prime’s Coverage List. FiercePharma 13 January 2015; www.fiercepharma.com/story/thanks-hep-c-pricing-war-gilead-abbvie-both-score-spots-primes-coverage-lis/2015-01-13. 16 Stern CW, Deimler MS. The Boston Consulting Group on Strategy: Classic Concepts and New Perspectives. John Wiley & Sons, Inc.: Hoboken, NJ, 2006. Siddhartha Jain is managing partner at SMC Consulting Group LLC, NY; sid.jain@ smcstrategy.com; http://www.smcstrategy.com.